The FPC has already issued a landmark decision Drospirenone in summary proceedings last year (S2013_001, mainly dealing with the doctrine of equivalents; see here). The present matter again pertains to methods of production of drospirenone (DRSP), a compound used in contraceptives (birth control pills). 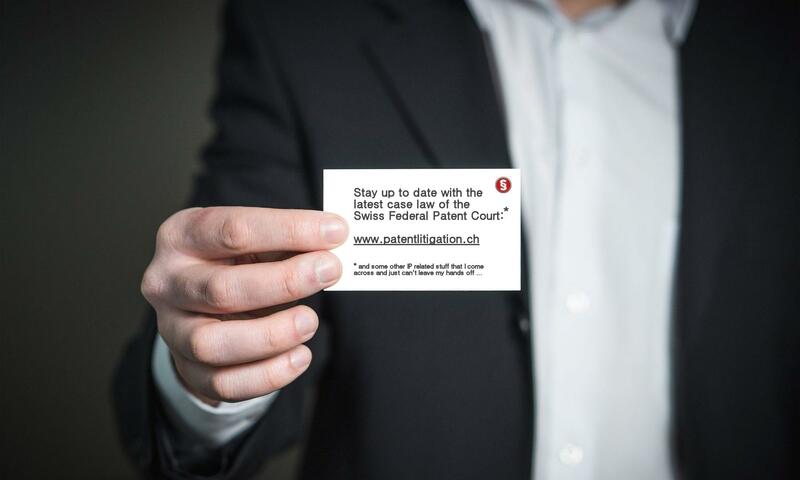 And again the same two European patents are at stake: EP 0 918 791 B3 (hereinafter the ’791 patent; see the European patent register for further details) and EP 1 149 840 B2 (which is a divisional of the ’791 patent; hereinafter the ’840 patent); see the European patent register for further details. 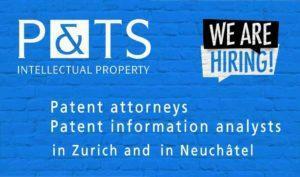 Proprietor of both European patents is Bayer Pharma AG, according to Swissreg (cf. here and here). 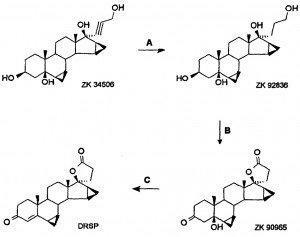 The starting molecule is the alkine ZK 34506 which is hydrated to form the compound ZK 92836 (step A). 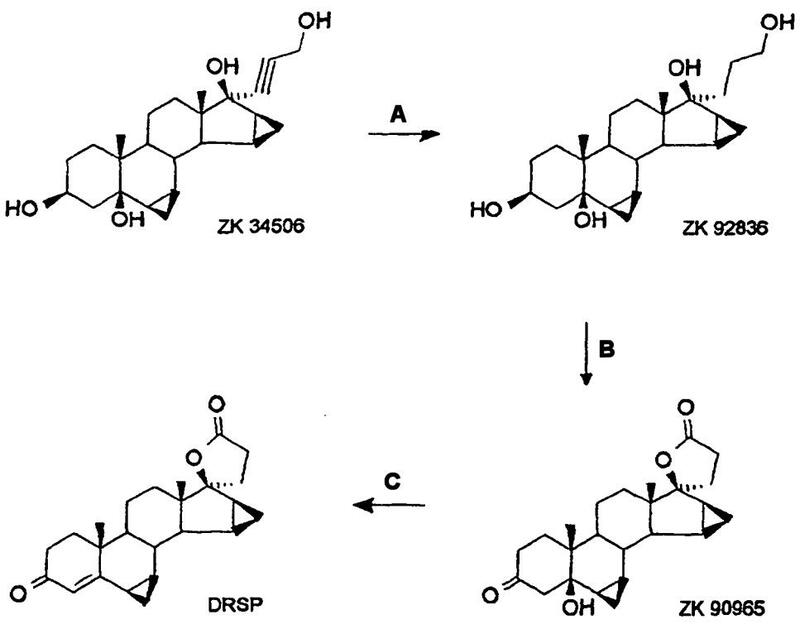 Next, ZK 92836 is oxidised to form the cyclic lactone ZK 90965 (step B). Finally, water is eliminated from ZK 90965 to form the enone DRSP (step C). In simple terms, claim 1 of EP’791 protects the reaction scheme as outlined above, wherein step B is carried out in the presence of a ruthenium salt as a catalyst. Step A is to be a catalytic hydration. Step C is not specified any further. On the other hand, the only claim 1 of EP’840 specifically pertains to step C only and requires that dehydration is carried out through addition of p-toluenesulfonic acid. An amendment of the statement of claim? 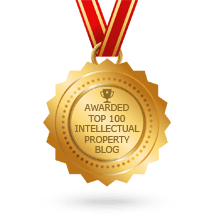 In the present matter, the plaintiff’s initial request for permanent injunctive relief only recited the dehydration step C (“dehydration […] by addition of p-toluenesulfonic acid or pyridine/water”). Nevertheless, the writ contained exhaustive arguments for infringement of both EP’791 and EP’840. In his answer the defendant inter alia alleged nullity of EP’840. The defendant argued that the request only relied on EP’840. The plaintiff then filed a subsidiary request in his reply. This subsidiary request was resembling the wording of claim 1 of EP’791, but wherein the oxidation in step B is carried out with the catalyst TEMPO. Unsurprisingly, the defendant requested that this request not be considered. Consequently, the defendant’s rejoinder only dealt with (nullity and infringment of) EP’840. According to Art. 227 CPC, an amendment of the statement of claim is admissible only if the new or amended claim is subject to the same type of procedure (what was undisputed here) and: (i) a factual connection exists between the new or amended claim and the original claim; or (ii) if the opposing party consents to the amendment of the statement of claim. Since the defendant did not consent to the amendment, only (i) could have been applicable. In the plaintiff’s view, a close factual connection was given since identical products and the same course of action (“Lebensvorgang”) were at stake. Moreover, both patents belonged to the same patent familiy. The FPC did not follow any of these arguments but rather emphasized that drospirenone as such is free state of the art. Only specific manufacturing methods are still protected by EP’791 and EP’840 (and drospirenone directly obtained by these methods; Art. 8a PatA). The request as initially filed and the later filed subsidiary request only pertain to the same course of action inasmuch as both concern drospirenone, but this does not yet constitute an infringement. To the contrary, the FPC held that there is no factual connection with respect to EP’791 and EP’840 since they protect different steps that may but need not be carried out in combination. Moreover, if the FPC had accepted the amendment of the statement of the claim, the defendant would have been barred from filing a counterclaim for nullity of EP’791 at this stage of the proceedings (a counterclaim needs to be filed with the answer; Art. 224(1) CPC) even though he had no reason to do so earlier since the initial request evidently only relied on EP’840. Thus, the FPC decided to not consider the late filed subsidiary request for lack of factual connection with the original claim. In my perception, it is highly likely that the present case is the continuation of S2013_001 in ordinary proceedings: The wording of the preliminary injunction in S2013_001 shows striking similarity with the main request for permanent injunctive relief in the present matter (four Swissmedic registration numbers; reagents identified as p-toluenesulfonic acid or pyridine/water). Moreover, the timeline fits: In S2013_001, the FPC had set a deadline within which the main action had to be filed (07 May 2013); Art. 263 CPC. The present writ was filed on 28 May 2013, i.e. presumably within a term extension of 3 weeks for filing the main action. In the meantime, this order is res judicata. A hearing is scheduled for December 09, 2014 in case No. O2013_009.